The Local Voice PDF edition comes with tons of extras that you can’t get in our newspaper. TLV’s PDF includes five pages of events from all over Mississippi plus six additional pages of puzzles, solutions to all, and comix. 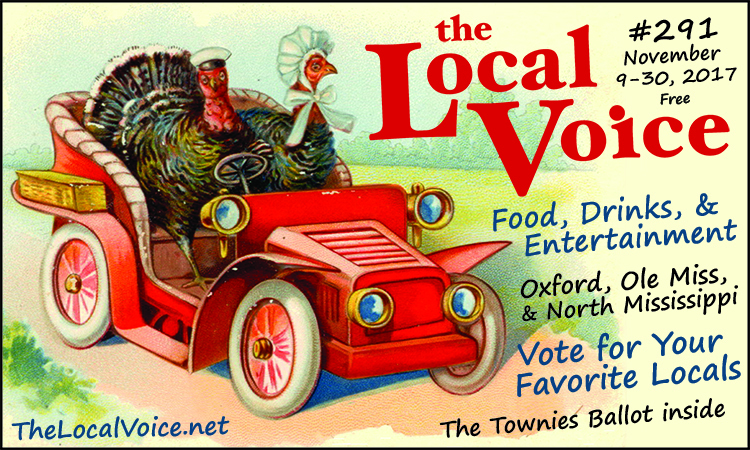 Oxford’s Favorite Poll has begun… vote now in The Townies! Graduate Oxford is selling pies made by Pastry Chef Dwayne Ingraham and half the proceeds go to charity. President Trump loses his twitter account and panic ensues. Get the details on where and when you can see the Oxford Civic Chorus. Fat Possum artists The Districts are making their way to Proud Larry’s! The Local Voice #291 newspaper is 16 pages and FREE at over 300 locations, but The Local Voice PDF is 28 pages and has even more events and shows in North Mississippi. TLV’s PDF has puzzles, comix, and solutions. Check out Entertainment in Oxford, Tupelo, the Delta, and beyond… North Mississippi events are in The Local Voice PDF – download now!